As someone born and raised in England, the word ‘movie’ and the spelling of the word ‘tonite’ rather than ‘tonight’ are linked in my mind with the tantalising vision of the United States that attracted me as a teenager. The wide-open vistas and blue skies that I saw in American films seemed to be free of the restrictions of the English way. I made the ‘Movies Tonite’ sign by drawing two lines and then overlaying with a layer of type in a contrasting colour. 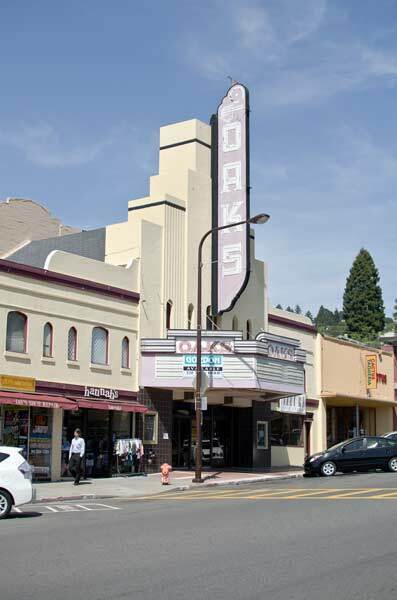 I photographed the cinema/movie theater in Berkeley, when I was there early last year. I was using the photo in another project when I noticed that if I played with the exposure sliders and the sharpness tools in Adobe Camera Raw, I could make the image look less real. Certainly not how I was taught to spell ‘tonight’ either. When I went to school, they were pretty strict about British English. Here in Canada, they also use the the British spelling .. colour, neighbour et cetera. I’m still in the learning stage of Camera Raw … by trial and error, mostly. Sometimes you could see the word «thru» [for space purposes] on some road-sign, and most people would say pffft or hmppphhh. Personally, I think they keep this up to ‘distance’ themselves a little from the big neighbour, south of the border..